Line a 12 x 18 inch baking sheet with parchment paper. Slice the onion into 3/4 inch rings. Separate rings and set aside. You'll need two bowls, one for the batter and one for bread crumbs. Into one bowl dump flour and corn starch and add half the soy milk, stir with fork vigorously to dissolve. Add rest of milk and vinegar and stir. In the other bowl, mix together bread crumbs and salt. Take each onion ring, dip in the batter, then into the bread crumbs making sure to get crumbs over all the onion ring and then put on baking sheet. 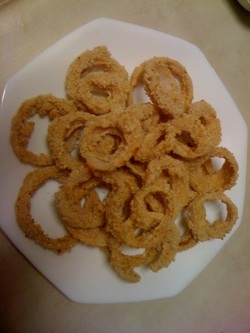 Do all the onion rings and then bake in the oven for 8 minutes. Use tongs to flip each onion ring and then bake for 6-7 more minutes. Serve warm with ketchup, BBQ or any other dunking sauce!